Great population movements have always marked humanity. Religious traditions are full of stories of people fleeing persecution, escaping diseases, running away from natural disasters. The biblical story of “Noah’s Ark” is probably one the first stories of both human and animal migration fleeing natural disaster, something we would call today the climate change consequences. Exodus, another biblical reference, tells us about the ancient migration of Jewish people fleeing political and racial persecution by the Egyptian Pharaoh to look for freedom in the land of Canaan. Mohamed, Prophet of Islam, established the first Islamic city in Medina, far from his beloved native city: Mecca that persecuted him and his fellowers. The date of that migration marks the “hegire” calendar or Migration calendar also called the Islamic calendar. Think also about the annual salmon run going against the current from the Pacific Ocean to spawn and later die in the rivers of the interior lands. Their offspring take the opposite route from the rivers to the cold and open water of the Pacific Ocean where they will grow and strive. And how about Caribou migration where every year many thousand of animals migrate from the tree-line to the calving grounds of the remote Artic Tundra and then back again to the summer and autumn. These animal migration are today strong symbols of who we are as a country but why do we forget them when it comes to human beings? These animal migration cycles came to be seen as natural phenomenon and part of the natural balance of our ecosystem. Many animals die in the process but the general population survive and get stronger and healthier because of it. So why, when it comes to human migration, barriers are established, walls are built and military check points are strongly defined and enforced? In the last years, the Mediterranean Sea has become to represent a hecatomb, a multifaith and multi racial graveyard of people dreaming of a better life. People fleeing wars, persecution, and poverty. People looking for a better future for their children: decent lives, a good education and most importantly peace. But this is not what we are hearing in the media or by some populist politicians. These refugees, are depicted as economical, cultural, and identity threats. Very few countries had the political courage to accept them and let them integrate in their societies and help them fulfill their dreams. Instead the majority of European countries for instance, refused to accept more refugees. They purposely changed their laws to stop these big numbers of people arriving from Syria, Iraq, Afghanistan, African countries, at their shores. Not only this, but the refugees are today tracked through drones, their biometrics data taken and shared with police and government agencies. They became to be represented as a homogenous entity; they are portrayed as looking the same, eating the same, behaving the same. As if refugees is a sub human groups with less humanity and more problematic behaviours. This narrative is dangerous; it perfectly fit the narrative of division between “us” and” them”. It makes the “us” feel better in their own bubbles and it makes the refugees and newcomers look like the “barbaric herds” that can never be trusted to be part of the “us”. But once again, who is “us” and who is the “them”? Aren’t we both “us” and “them”? Isn’t there a fluidity and resilience in our common humanity that makes us simultaneously the same and different? It is exactly this human characteristic that is being attempted to “erase” or overlooked within the refugees and that is after all despite all odds always present and that would finally brings us together. 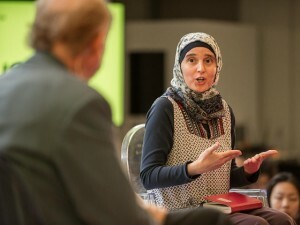 Monia Mazigh is an author and National Coordinator of the International Civil Liberties Monitoring Group.